Good Friday 2015 saw my club Bournemouth Outrigger Canoe Club enter it’s first OC6 race. We only formed at the start of the year, and had managed to scrape only two sessions together as a crew coming into the race, but as a bunch of competitive SUP paddlers we were all fit & all keen to test ourselves against 6 other established OC6 crews from around the UK. The race was around Hayling Island. 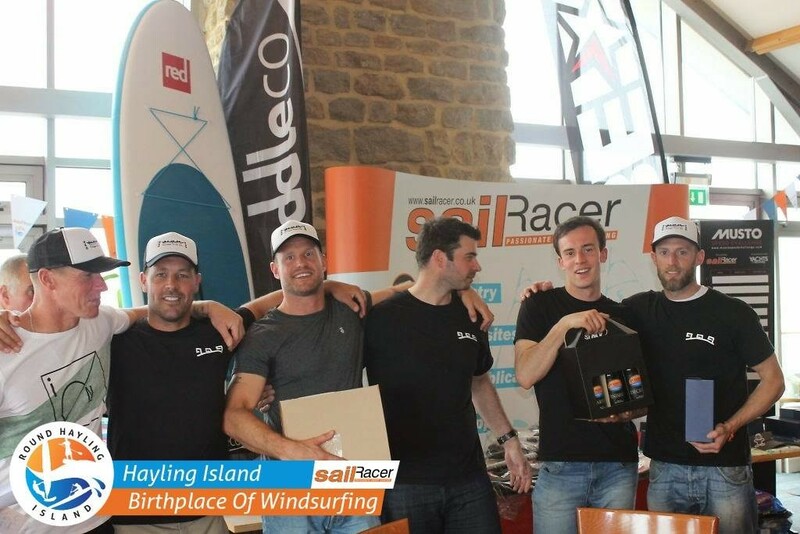 Traditionally a popular Windsurf event this year they welcomed any form of paddlesport to complete. The distance is 22km wish some sheltered water in the harbours but some open ocean sections where conditions could be varied. We enlisted outrigger guru & close friend Steve West to help us rig our loan canoe Mahi Mahi. He suggested something totally new rigging wise so we took the risk and changed it all. Taking it out for a quick spin it was running like a dog… the ama pushing lots of water. To make matters worse a bad call by me (seat 6) meant we huli’d right on the beach in front of all the other crews… not a great start. We were pushed for time & had to run to the race briefing leaving only 20mins to all get changed, ready to race & re-rig the canoe. Steve worked his magic using some chocks to adjust the ama angle & we all just jumped in at the deep end just in time to paddle to the start line. There was a little confusion on the start procedure & start line (or maybe just bad planning) by all but two of the crews, meaning most were ahead of the start line trying to back paddle when the hooter went! We were ready in exactly the right spot but now had a row of 44ft canoes across our bow & we were charging a race pace… after a few little altercations we cut a line & the boys got to work. We were in 3rd but gaining fast… quickly we were alongside leaders PRCC in their superlight unlimited canoe. Inch by inch we gained… it was a brilliant moment in the race. The crew were silent apart from the ‘huts’, heads down but aware of the competition right alongside. After some defensive steering & sheer determination by our crew & we crept ahead into the lead within the first 10-15mins. With the lead safety boat just ahead I spotted an opportunity to use some bumps caused by the boat to accelerate away. We hopped on & milked the boat for all we could, riding the wake left & right. I was really really working the crew hard making them push for every bump we could to open a gap on the chasing crews behind. Before we knew it we were at the top of the island flying through the bridge at 15kph, into the upwind section. We knew we’d be good here, happy in rough water & used to grinding out into the wind in training. The guys dug deep again & we hit it hard. The conditions were rapidly changing with increasing winds & sea fog. As we neared the mouth of Langstone harbour visibility was very very poor & we had no idea where we were going. We took a punt & luckily we were in about the right spot & headed out onto the open ocean section along the South Coast. We had to cut inside 3 markers as part of the course which were hard to spot in the conditions, the first we were way too far out & had to cut sharply in to make the mark. The PRCC crew were still just about in sight through the fog so I tried to get the guys to make one last push to get them out of sight. They responded with all they had left in the tank & pulled us clear to take the win with a good lead. Our GPS tracker wasn’t working but my official time by Garmin was 1.44.06. It was an amazing experience, and a total pleasure to steer for the crew who gave it their all. Huge thanks to all the crew, all the ladies crew who came & cheered us on at the finish, you wouldn’t believe the difference that makes! 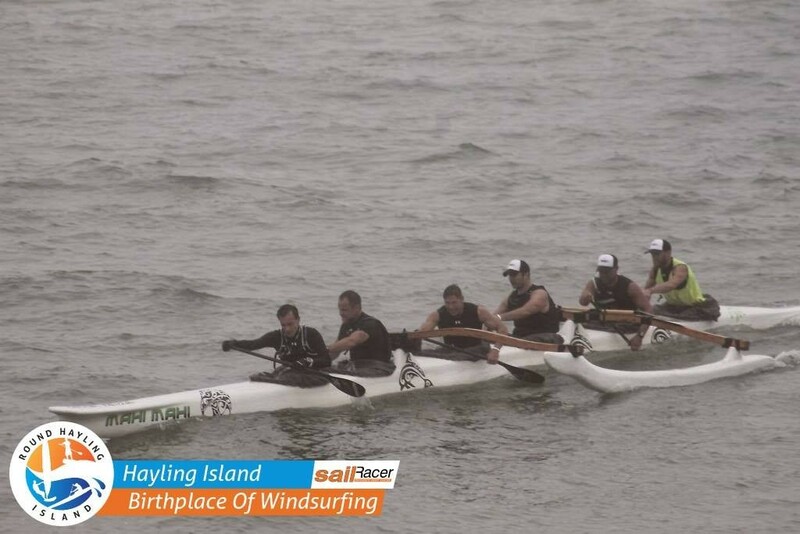 Thanks to www.myh2pro.com & www.quickbladepaddles.com for supporting the club and for the other crews who made that an epic race.